Members of the Interreg MED thematic community on sustainable tourism met at the second community building event in Athens on 4 – 5 October, where they adopted a common declaration. 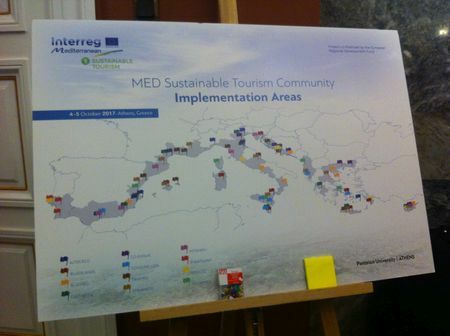 The Community Building Event of the Interreg MED’s BleuTourMed Horizontal Project on sustainable tourism brought together partners from all modular projects, as well as stakeholders involved in the community. Participants had the opportunity to explore collaboration opportunities with other projects and discuss the implementation of joint activities to improve their efficiency and impact. During the meeting, the community members, including local and regional authorities, universities and the private sector, signed a common declaration. The Declaration sets out the common objectives of the community, as well as guidelines for future cooperation and collaboration between the projects. Participants from the community’s 14 projects took part in working group sessions, where they got to know each other better and look at opportunities to work together. The aim of these projects is to study, test and capitalise innovative instruments and actions towards the enhancement of tourism sustainability in the Mediterranean. 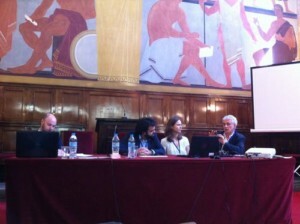 Reinforcing exchanges and sharing knowledge on the themes tackled by each modular project is a way for BleuTourMed to strengthen the idea of integrated approach embraced by the thematic community. The working groups on ‘Strengthening sustainable and responsible tourism’ and ‘Sharing methodologies for joint action’ allowed the participants to learn more about each other’s’ projects, identify common issues and explore how to work in an integrated way when delivering results. The CPMR’s InterMediterranean Commission, which representing the CO-EVOLVE and MITOMED+ projects at the event, presented its approach on ‘Capacity building & Stakeholders’ engagement’ within the MITOMED+ project. It also stressed the importance of upcoming steps, especially those to take place during the capitalisation phases, such as the necessary implication of policy makers at different levels. The second working cluster session was dedicated to the activities that are expected to be implemented in the pilot areas. It enabled the partners to better identify the common geographical pilot issues and to start thinking about the implementation of common activities by the projects located in the same areas. Additionally, in order to ensure the effective development of all modular projects in the MED Communities, BleuTourMed introduced the PANORAMED Axis 4 project, launched on 27 – 28 September in Sevilla, as well as its upcoming activities. 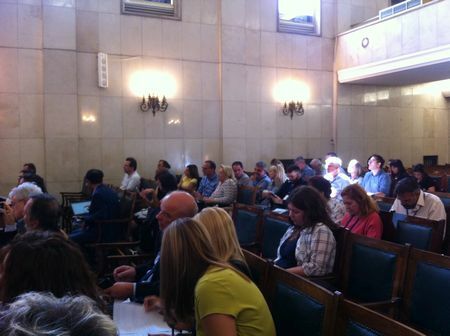 A methodology for joint action, including the Internal Community Database and a proposal to raise awareness and understanding of the community by using a Communication playbook strategy, was also shared. The main conclusions from the event underlined the need for modular project partners to strive for improved collaboration between their respective activities and methodologies. This could be achieved by finding a better way of improving collaboraiton and working together within the area of sustainable tourism development.